Have you ever seen a horse smile? When Laura, Keith and their two boys came to the Harmony Equine Center in search of a “never-could-be-replaced ‘replacement’ horse,” that’s just what they saw. 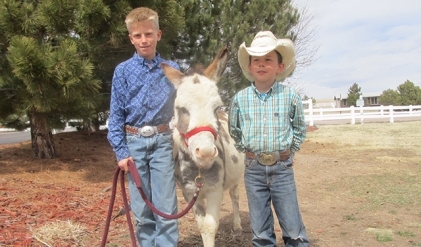 Laura and Keith’s 11 and 7-year-old sons have quarter horses that they have been riding since they were about 4 years old. The boys and their horses compete in gymkhana, and when it was time to think about getting a new horse because one of their mares is getting older and will be retiring soon, a friend told them about Harmony. The family popped on the Harmony website to see available horses, and within a few minutes, one of the boys spied a beauty worth visiting. While at Harmony, the family met with Cory, Trevor, Brett and the rest of the team. Laura said they immediately felt at ease and knew the Harmony folks would help them find a good match for their son. On the way to the arena to ride the horse the family originally came to see, there was Puddleduck. With gorgeous big eyes, 7-year-old Puddleduck watched the boys, and as they rubbed her and gave her lots of attention, that’s when it happened. Puddleduck smiled. “It was love, and home she came,” said Laura. Both Puddleduck and Speck fit in nicely with Laura and Keith’s other horses, and the family couldn’t be happier. “Thanks a bunch to Harmony for giving us EXACTLY what we were looking for and giving all these four-hooved friends happy ever afters,” said Laura and her family.